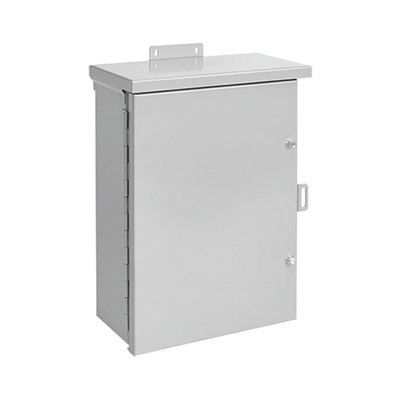 Hoffman Medium hinge cover enclosure in ANSI 61 gray color, features galvanized steel construction with polyester powder paint finish. It has a dimension of 48-Inch x 36-Inch x 16-Inch. The 14/16-gauge thick enclosure has NEMA 3R rating and IP32-degree of protection. It is stud mountable.